1. Walk out into the hallways right after the tardy bell rings. Are there more than one or two kids in the halls? Are those kids ambling, or scrambling? If the answer to either one of these is yes, then you and your staff are not in control of the amount of content being delivered to the students, and therefore the school is not doing its main job. You are not in control of the school. This means that you are not performing your main job, which is to ensure that instruction can take place. 1a. Let me be clear: the main job of a school is NOT to provide a bright clean place to hang out. It is not there to keep potential thugs or partiers off the streets. It is not there to provide social services such as meals, haircuts, or visits with health care professionals. A school must primarily exist to provide the opportunity to gain an education. A school must emphasize this as its main mission, or it will be merely a very expensive community center full of people who don't seem to know very much-- and that could include the staff, and that means YOU. 2. Walk out into the hallways fifteen minutes after class has begun, or ten minutes before the end of a class period. The last class period of the day is especially good for this. Are there kids wandering around (Wait! you interrupt. Don't you mean "students?" And the answer is, No, I do not. Just hanging out in a school does not make one a student any more than just hanging out at Cape Canaveral makes one an astronaut. But I digress.) Kids skipping class with impunity means that you and your staff are not in control of the amount of content being delivered to the students, and therefore the school is not doing its main job. You are not in control of the school. This means that you are not performing your main job, which is to ensure that instruction can take place. 3. Walk into the bathrooms. Smell smoke? If you want to see how much damage and panic can ensue from a real fire evacuation, just continue to ignore this, and then stand back and watch the fun. This means that you are not performing your secondary job, which is to ensure that the school is a safe and orderly place to be. 4. Does your school have a behavior code or guide? Do you regularly ignore or act unaware of the consequences prescribed in the behavior guide and merely "talk to" students with referrals or place them on "suspended sentences?" Do you then wonder why the staff either a) no longer trusts you or b) no longer enforces the behavior guide themselves? This means that you are not performing your secondary job, which is to ensure that the school is a safe and orderly place to be. Only have the rules you are going to enforce. Otherwise, stop pretending and get rid of the behavior guide. 4a. Really, you're a grown person and you want to be "friends" with adolescents? You need to be something much more valuable to them: an adult whose behavior they can predict and rely upon, and someone who cares enough to encourage them to better behavior and safer behavior by predictably responding to poor choices with correction and redirection. The kids really don't think that spineless poseurs are cool. They think they are chumps. And chumps make more work for themselves by not being clear about what the limits for behavior are, because kids will push until they find out those limits. 5. Do you make eye contact with staff when they are speaking with you? Do you respond to emails in a timely manner? Do you seek out information and then act upon it? If you want to be openly supercilious, then go work at some snooty retail outlet, where they seem to cultivate such disregard in their staff. Just trying to be helpful. You should try it sometime. It would probably be inappropriate for me to print this out and bring it to school, huh. That's a shame, as I can think of a couple of people who would benefit from reading this. I love it when you're helpful! Well done! 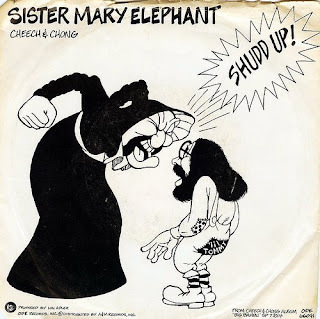 As a Catholic I find the "Sister Mary Elephant" comic offensive. Why would you want to continue a stereotype of these women who have served society so well for so very long. What next the "N" word with watermelons? I used to enjoy your blog, but no more. Ah, come join the PBS party! Our administration has been on a crusade to get the kids out of the halls the past couple of years. We enforce tardies with an unmerciful vengeance. And, I have to say, it's been working. My room is at a high traffic intersection and I've been able to keep my door open a lot more lately. At least you don't have "watch your aim" signs in the bathrooms. Ms. George, this is indicative of that "broken windows" theory that was spoken of back in the day. Don't fix the broken windows in a neighborhood, and even worse things start to happen to what was once a decent place. And speaking of heavenly, anonymous, I am sorry you were offended, although I do not see this cartoon as being something that a) models behavior that should be repeated, as I stated, nor b) equivalent to making an attack on Catholics similar to racial slurs on African Americans, especially since I was introduced to this song by a nun active in the social justice area who found it very amusing. Farewell, and Godspeed. Great post. Should be required reading for administrators or potential administrators. But there's a saying in Spanish--common sense is the least common of all the senses--that seems to apply here. You are so right! I tell my kids that "common sense" is the greatest absurdity there is. ooooo -- this gives me shivers. you have defined our CBLP (Crazy Boss Lady Principal) The part about ". . . never looks you in the eye . . ." is spot-on and creepy. Do you read the funnies? Today's Frazz uses a quote: "For every complex problem there is a simple solution. And it's wrong." No clear attribute. It goes with your list perfectly. IF I just ignore it, it will go away or it does not exist, or, if need be, I KNOW NOTHING ABOUT IT. GRAYCIE ..... YOU ARE around and about! How are you? I've missed you ! First of all, since Polski beat me to it: "Hey! Graycie!!!!!" And I LOVE Frazz. I love the characters, the demand for some literacy, the fact that they portray smart kids who are not nerds, and the fact that Frazz has great taste in music, just for starters. And so far they don't seem like CBLPs, thank God. They just seems like CIOTHYWWTBFADKNF. That stands for "Clueless In Over Their Heads Youngsters Who Want to Be Friends and Do Kids No Favors." I don't think they're maliciously intentioned. i think that a) they are part of a generation that sticks its head over its BlackBerries rather than communicates face to face and b) they have little practical experience as educators who value what is done in the classroom, and little experience of same. I also fear they don't really reflect deeply upon good practice, to use a Buddhist analogy. Polski, your plan sounds tempting. Oh my goodness...if only I could print this out, although I have shared it with a few others and it all rings sooo true! Yes, darn it, now turn that phone off!